A nice morning shave in India. 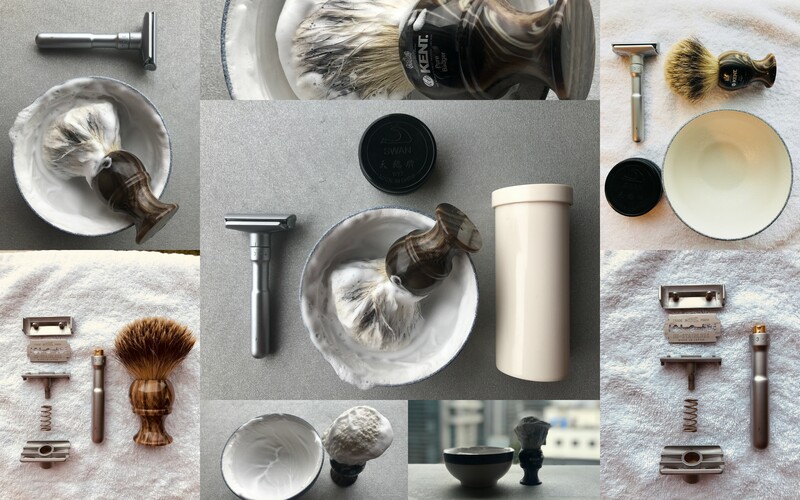 What better way for a gentleman to start his day than a nice leisurely shave? First lets look at the razor. There is little doubt that the mercer Futur is one of the best available mass produced DE razors. It is fully adjustable from a full crop trimmer (#6) down to a feather duster (#1) and all points between. I had shaved two days ago so a #3 was my setting of the day. It is a smooth matte finished razor, all stainless and easy to take apart for cleaning. I took the opportunity to take mine apart and give it a thorough wash and dry after I completed my shave. Some say the head on a Merkur Futur is too big to get under the nose properly – personally, I don’t find that at all. Be careful when adjusting the setting that you don’t cut your fingers on the blade – grip the head by the short edges and adjust the handle with your other hand – well away from the blade. Now the brush (disclaimer: I DO NOT sell this brush and have no association with Kent Brushes) The Kent H12 – is a mock horn handled brush with a massive 31mm knot. It is a beast and lathers like a dream. A good loft, medium backbone and pillowy soft gel tips. It is a fantastic brush to shave with and it went to work on the soap in no time at all. If you can get a Kent brush – do so!! I am lucky this was bought for me by my sister as a Christmas present last year. She lives about a mile from the Kent factory!! One day I am going to have to go in and see if I can get a tour of the workshops. The soap – TOBS Avocado – brought a blob of the Taylors of Old Bond Street avocado soap in a small container – enough for my week away – 2 shaves worth. This soap is great, has a nice vegetal small with, to my nose, overtones of cucumber. It lathers like a dream and is super slick. When I get a new razor to try this is always my go to soap because it has consistent performance and is super slick. The bowl – a nice, textured, bowl from a store called Franc Franc in Hong Kong. Nothing fancy, does not matter if I forget or break it and it just works. A serious lather bowl for 2 bucks! What is not to like?